One of the Cape Peninsula’s most talented runners lives in a wooden shack in Masiphumelele with his mother and four siblings. His name is Inga Ngwenduana; he is 18 years old. He is short and slight but muscular, with sinewy knots in his biceps and legs. He has small scars on his face and an embossed ridge from an old soccer injury stretching down his left arm. He no longer plays soccer and has recently devoted himself to distance running, which he sees as an escape from poverty. Since his first competitive race last October he has achieved podium positions in seven out of eight events. His bedroom has a thick black plastic sheet nailed over the planks for rainproofing. It billows inwards from the wall when the wind picks up. On the floor are large buckets filled with water from a nearby communal tap. Three mattresses are piled on Inga’s bed; at night, his brothers, aged 10 and 11, take them down to sleep on the floor. Inga’s mother, a domestic worker, shares the second room with her young infant. Inga’s 19-year-old sister sleeps on a couch in the kitchen. At her feet the front door latches shut with a bent nail. Against the opposite wall are shelves with a television set, cooking pots, several porcelain ornaments, and Inga’s collection of medals. “This isn’t a good place for an athlete to live,” Inga said. This month, Inga is running the Two Oceans half marathon, aiming for another medal. His quickest 21 km time to date, 1:22:29, falls within the top six junior positions of every Two Oceans race since 2012. Although comparing speeds over different courses and under different weather conditions is an imprecise measure of ability, these records suggest that Inga has a reasonable chance of success. Inga happened to be busy with speed exercises around the time I spoke to Shuttleworth. 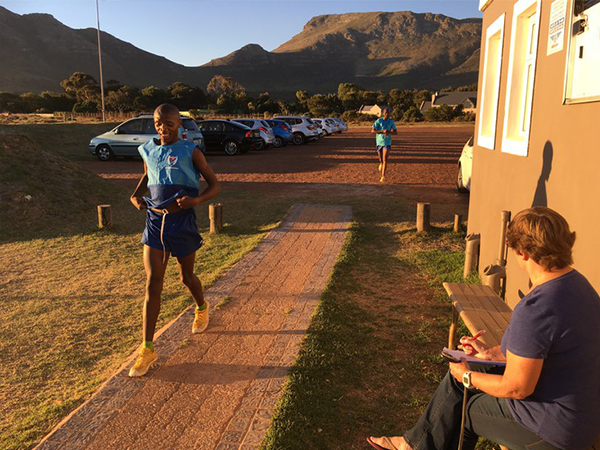 On weekday afternoons through March and April, Matusso, his mentor, led him through a rigorous training program at the Noordhoek sports fields, 5km walk from Masiphumelele High School, where Inga is in Grade 11. “He needs to work on his strength and speed,” Matusso said. On 28 March, Inga ran two 3km intervals followed by ten 400m laps. The next evening, a Wednesday, Satori held its weekly 5km time trial. Showing no signs of fatigue, Inga finished second in 17:52. Time trials at Satori have an easy, sociable air. The clubhouse lies at the edge of Noordhoek’s wetlands, beneath the wide southern arc of Chapman’s Peak. On 29 March, most of the cars in the parking lot were expensive: BMWs, Volvos, Citroens. Members in bright kit stood in front of the building, joking with one another and stretching their legs. Smoke from a braai fire spilled across the patio. I found Inga, Matusso and two other black sponsored runners sitting apart from the group inside the changing rooms. The lights were out and the air smelled stale. Around the men, Inga’s voice was deeper than when I’d spoken to him alone. He rolled on his back and tugged at his hamstrings before the runners walked outside for their 6pm start. Around 20 members lined up and waited for Sharwood to send them off. (Despite being chairman, Sharwood is not himself a runner. “I just love the club environment,” he told me.) Matusso was recovering from a knee injury and didn’t participate. “My body is telling me to rest,” he said once the runners had left. But training a township teenager is difficult. Many of Inga’s peers have begun drinking or using drugs. Youth gangs fight violent battles in the streets; last year, one of Inga’s childhood friends died after being stabbed outside the school gates. At home, loud music from shebeens interrupts his sleep. His mother cannot afford nutritious food for sustaining high performance. “The situation is not good for a runner,” Matusso said. I dropped the men and parked near Inga’s house. A dirt track led to a concrete bridge over a trash-strewn canal, which doubles as an open sewer. A young woman in pyjamas stood filling a bucket from a plastic tap. The homes, built from planks and tin, pressed tightly together, traversed by a narrow, zigzagging alleyway. Open doorways gave sudden, intimate glimpses of lit interiors: television sets, vases on tables. We brushed past people moving in the opposite direction and ducked beneath several clotheslines, then stepped onto an uneven boardwalk assembled from salvaged wooden beams. “This is the wetland,” said Inga. The northern fringe of Masiphumelele extends into Noordhoek’s largest water body and is elevated, in places, on stilts. 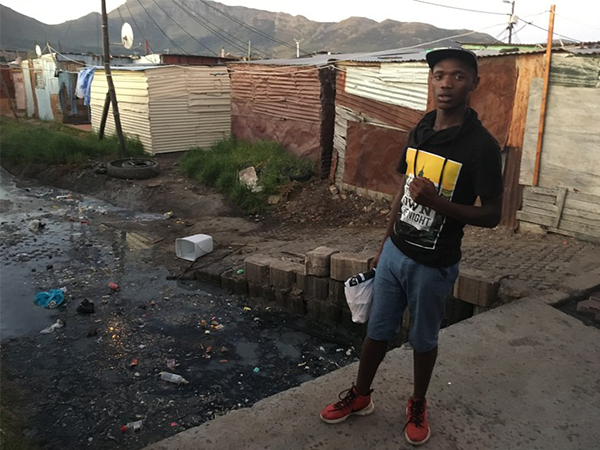 The City of Cape Town regularly demolishes shacks in the wetland but hundreds remain. We reached Inga’s house, a low, pink structure, but he wanted to take me further. The homes at the end of the walkway were flanked by tall reeds. Inga stood on his toes and pointed to the tip of a large brick house, a unit in the Lake Michelle luxury eco-estate. “See, we’re in Noordhoek,” he said, laughing as if pleased to surprise me.